SONAX Upholstery & Carpet Cleaner thoroughly removes stubborn stains from fabrics, upholstery, door panels, carpets, and headliners. 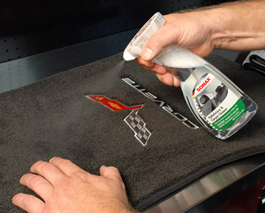 The foaming action traps and removes the dirt particles and their odors, leaving your car interior fresh and clean. Who says multi-tasking doesn't work? SONAX Upholstery & Carpet Cleaner does two jobs well: it cleans and it deodorizes! As it lifts unsightly stains, SONAX Upholstery & Carpet Cleaner traps and eliminates odors, leaving behind a clean, fresh scent. It doesn't just mask odors - it eliminates odors! SONAX Upholstery & Carpet Cleaner is a must-have for pet owners. Erase dirty paw prints and eliminate pet odors in one step. Got kids? Keep a bottle of SONAX Upholstery & Carpet Cleaner handy for accidental spills. SONAX Upholstery & Carpet Cleaner is packed with dirt-targeting surfactants. Surfactants bond to foreign contaminants and lift them from deep within carpet and upholstery fibers. This proven technology works effectively on stubborn stains and dirt inside your vehicle, your RV and your home. Spray the desired area with SONAX Upholstery & Carpet Cleaner. 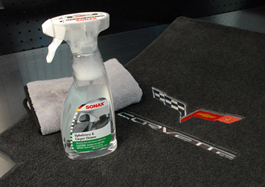 SONAX Upholstery & Carpet Cleaner removes stains and leaves a fresh scent. To help SONAX Upholstery & Carpet Cleaner perform its best, use a Mat & Carpet Scrub Brush to agitate the carpet and upholstery fibers. 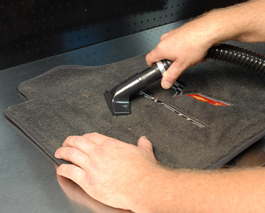 This agitation will help the dirt rise to the surface where it can easily be vacuumed away. Undo the damage to your car's interior! 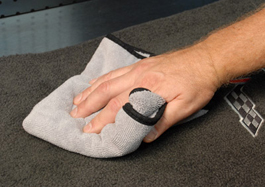 Use SONAX Upholstery & Carpet Cleaner to clean and deodorize carpet and upholstery in one step.